Can’t make it to the clinic with your sick or nervous kitty? Our house call service may be just the solution you need! There are many situations in which bringing your animal companion to the vet simply isn’t possible. Perhaps your cat is too sick to make the trip. Or, maybe your kitty experiences such intense vet-visit anxiety that bringing him or her in is just too stressful for you both. Perhaps you have multiple cats and scheduling and managing multiple appointments is too much to handle. Or, maybe it’s just that you’re simply too busy to find the time. 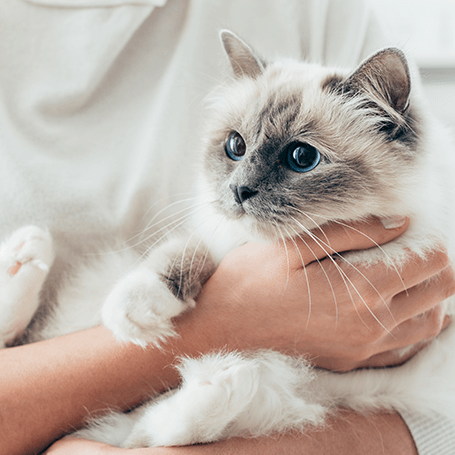 Whatever the reason, at Cats Only Animal Hospital, we believe your furry family member deserves the same quality care as all of our other patients. That’s why we offer house calls as part of our comprehensive feline health care services. Our clients and their animal companions benefit from house call services in a variety of ways. Pet parents can enjoy the convenience and time savings of not having to transport their pets from their homes to the veterinary clinic. Cats especially enjoy the benefit of receiving high quality, one on one veterinary care in a setting where they feel most at ease. Multi-pet homes also benefit because it eliminates the need to transport several animals, either separately or at the same time. With a house call, all of the animals within the home can be seen in one convenient appointment. At Cats Only Animal Hospital, we believe you shouldn’t have to sacrifice quality veterinary care when a trip to the clinic isn’t possible. Let us bring our services to you and help keep your feline family members happy and healthy. Call us today to discuss whether house calls would be a good option for you.